Lynne Patton standing behind Congressman Mark Meadows during a congressional hearing on Feb. 27. 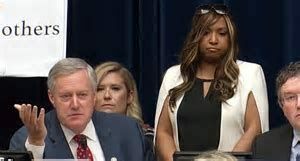 (TriceEdneyWire.com) - North Carolina Congressman Mark Meadows trotted out Lynne Patton, a Black woman, to say President Donald Trump wasn’t a racist after Michael Cohen, Trump’s former fixer, testified before a Congressional Committee that Trump was a racist. Meadows played a key role in the birther movement that damaged President Barack Obama’s presidency by casting doubt that he was born in the United States, a requirement to be president, while paving the way for Trump to enter the White House. In 2012, at the Blue Ridge Tea Party Candidate Forum, Meadows, a Republican, said, "We’ll send Obama back home to Kenya or where ever it is,” to loud applause. A video of Meadows making the comment has been posted on Twitter. 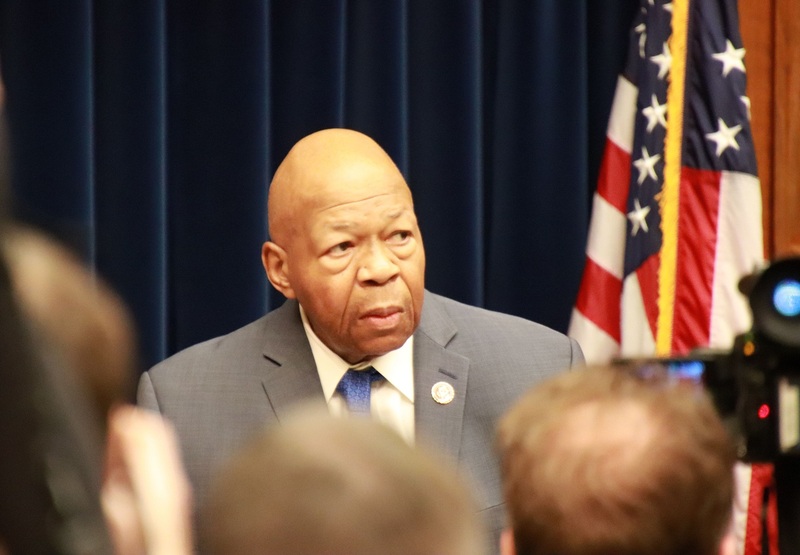 Cohen, who testified before the House Oversight and Reform Committee Feb. 27, listed several examples supporting his assertion that Trump was a racist. Congressman Elijah Cummings, (D-Md.) is the committee’s chair. Cohen testified that Trump called Black countries “shitholes” and said Blacks were too stupid to vote for him. Trump also said only Blacks run "shithole countries". He made that statement when Barack Obama was president of the United States, Cohen said. He also pointed out that there aren’t any Blacks in top positions in the Trump administration. Meadows, chairman of the ultra conservative Freedom Caucus, ordered Patton stand behind him during the committee hearing to refute Cohen’s allegations that Trump was a racist. Patton, a regional executive for the Department of Housing Urban Development, and a Trump appointee, didn’t speak. After a few minutes, she sat down. U.S. Rep. Rashida Tlaib (D, Michigan) called Patton a prop, and Meadows almost burst into angry tears, believing Tlaib, who is Palestinian was calling him a racist. The heated exchange was among the most intense parts of the highly anticipated Cohen hearing. On Fox News, a disgusted Patton denied she was a prop. She said committee members put more faith in a White man going to prison than a highly educated Black woman. A judge sentenced Cohen to three years in prison for lying to Congress. Cummings came to Meadows’ rescue, claiming he was one of his best friends. Cummings’ intervention angered some observers. Later, Meadows said he made the comment about Obama to win an election. He and Tlaib later made up.